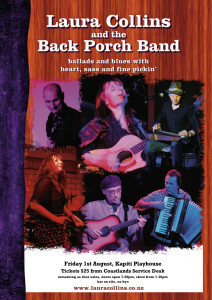 Back Porch Ballads and Blues - Kapiti Playhouse Inc.
Laura Collins and the Back Porch Band deliver their back porch blend of acoustic ballads and blues at the Kapiti Playhouse on Friday 1st August. This will be a cabaret style show. Laura Collins is a singer, a front person, a songwriter and most importantly an entertainer. Along with Laura’s originals you can expect to hear some alt-country covers from the likes of Gillian Welch and John Hiatt, a little BB, a little Koko, some Muddy Waters and many more with a feast of soulful vocals, sweet guitar solos, honky tonk style piano, zydeco accordion, warm upright bass and percussive drums. The Back Porch Boys are all journeymen who have played many juke joints in their time, George Barris, a seasoned bass man whose early fame dates back to the days of “Highway” on upright bass and Matt Newman, originally from Portland Oregon, who brings a wealth of experience and great country-blues pickin’ on guitar, Al Norman (ex-Warratahs, now works with Darren Watson and the Real Deal Blues Band) on accordion and Paddy Burgin (singer/songwriter and luthier extraordinaire with many albums to his name) on lap steel and mandolin. Expect a toe-tapping good old southern time on the back porch. Tickets available from Coastlands Service Desk. Tickets $25, any remaining tickets available on the door. Doors open 7.00pm, show from 7.30pm. Bar on site, no byo possible.